Today will seem like just another day for many of you, but nothing could be further from the truth. You see, today marks the demarkation between the old and the new, in other words we will use this day as a marker for when the first humans were finally welcomed over to the other side. When we say the other side, we refer of course to the fact that the timelines you have been straddling for some time now will start to diverge, and you will slowly but surely see how the old dissipates and the new starts to emerge, literally from the shadows that covers the old. This may sound strange, but let us give you some examples as to what this will entail. We have previously touched upon the fact that you are now approaching the point of no return, and this is in fact what we have been alluding to. This is a day that will in many ways go down in the historybooks as the day when everything changed, but on the outside, nothing much will give away any hint of this momentous moment. No, there will be no fanfare, no special numerical sequence in your calendar that sticks out, no celestial miracles or omens, just a seemingly normal day, much like the others that come and go. But this day will certainly leave it´s mark on all of you who have already decided to cast their lot with the new world, as you have now taken that final, decisive step across the border and into unknown territory. But the strange thing is, this unknown territory will feel so much more like home than the place where you were born and spent all of your previous lives, and you will get a strong sense of finally, finally coming home, after so many lifetimes on a planet that felt more and more foreign to you. Your connections with the remnants that are stilll lingering in the third dimensional effigy that the rest of this little planet´s inhabitants still refer to as Earth will fade away one by one. One day not too far off, the last link that still holds you down there in some ways will be severed, and you will finally be free in every sense of the word. This may seem to be a mere fiction of imagination, as you all have countless of these threads going back and forth between you and the old world, but we think you will be amazed at the speed of this severance process. We are well aware that for now, the old world and all of its connotations will have a powerful grip on your minds, as it is only a few individuals who have managed to make themselves independent of all of the old systems that still governs the rest of you. Remember, your society has been set up in such a way that it guarantees the disempowerment of its citizens, as it is not easy to do without everything controlled by the world of finance and governments that surrounds you on all sides. But now, these institutions are crumbling one by one, and their stranglehold on you all is lessening by the day. We hasten to add that from your point of view, it will seem to be different, as you have yet to be able to free yourselves from this illusion of a man made existence, where everything and everyone is beholden to a system that is so rigid and conform it has literally sucked you dry in more ways than one. But now, as these worlds are starting to drift apart, you will be able to breathe the unpolluted air that will help you to see things so much more clearly, and with clarity comes strength, and you will be able to use this newfound strength to rip off the last of these hooks and barbs originating in the old way of thinking and living. Remember, your freedom does not come in the form of a liberating army, suddenly appearing in the form of shining ships hovering above your planet. No, it comes in the form of every individual human being called to find his or her voice, the voice that has been dimmed down for centuries inside of them. This voice is starting to gain strength, and what it says carries more weigth than anything else in the universe – literally. For if you refuse to listen to that voice and heed its advice, then nothing we can do will change your destiny. You are the only one who decides if it´s time to wake up and face the consequences of the life you have been tricked into believing is the only way to live, and if you do so, you can be certain that you will find the strength to rip this old fabric of lies asunder and start afresh in the new world unburdened by that baggage of fear and guilt. If not, you will stay behind in the morass of disillusion and disbelief, where the sea of fear will rise ever higher as the days go by and all hope seems to drain out from the broken containers holding the old way of living. The choice is yours sweet ones, and for so many of you, the choice has been easy. You have already stepped across the divide, and you have embarked upon a journey towards the first part of your new life. Bon voyage dear ones! Remember, you are not travelling solo, we are with you all of the way, and soon that will become more and more apparent as the shores of yesterday starts to fade away on the horizon. Our mission today is to give you further insight into your very near future, in other words, give you a sneak preview behind the veils as it were. You do not have long to wait now, sweet souls, as your call for freedom have been heard. We are all eagerly awaiting the day when we meet again face to face, for of course we have met before on so many happy occasions. You do not perhaps have any clear memories of these previous meetings, and rightly so, because if you did, you would indeed have a hard time returning to your physical bodies and rejoin this mortail coil as it were. Let us explain. You are in so many ways one of us, but as you chose to leave these lofty abodes to come down to earth and join the throngs there, you needed to forget your origins in more ways than one. You see, we are all well aware that residing on Planet Earth in a physical vehicle such as yours, is by no means an easy sojourn to make. As we have touched upon earlier, this planet is a place for educating souls, and no place else in the multiverse are the lessons as hard as they are here. That is why so many souls choose to go here, as this is the only place to experience so much hardship and toil, a place for stretching your limits in many ways if you will. But in order to do just that, the memories of a previous existence needs to be obliterated. If not, the temptation to leave all of this toil behind and return home to a much more peaceful existence would be high indeed, and that will not do, as all of the souls gathered here now have a very specific task to fulfill while residing in an actual physical body. In other words, in order to complete the task of rising the level of energy on your planet, we need the presence of enlightened human beings, as they are the only ones that can anchor all of the needed frequencies that constitutes this ascension process. We are aware that for many, the lingering memories of a much more comfortable and certainly far less dramatic existence have been making themselves heard, and for them, the idea of staying much longer in this density that currently envelopes your planet seemed to be too much. Therefore, many leave, but if they do, they also let go of their end of the line so to speak. In other words, they sever the connection that has been made between them, the incoming energies and the surface of the planet. It is like letting go of an anchor so that it is pulled free, thereby increasing the strain on all of the other anchors that hold the connection true. So if you have felt the strain escalating at times, this might well be the reason. Never fear that the strain will be too much, because every time one of you let go and flee home, there is always another one waking up, ready to step forward and pull in the slack. We would never allow the connection to go completely, and as the number of awakened souls is steadily rising, that will never be the case. But we put this out there as a reminder that your job does not only entail a personal ascension, you are also here to do a very, very important job on behalf of everyone else. Some people do not see that, and when they feel that they cannot resist to let go of their connection to your world, they think that it is only a personal release to let themselves return to the heavenly realms to call it that. So again, it is imperative to keep in mind that although it can at times be very unpleasant to anchor all of this energy through a very hard working physical body, it is in fact the reason why you all are here. So please remain firm, as you have been well chosen for this task. And remember, you chose this task for yourselves as well, it was not forced upon you. And please, remember to rejoice in the fact that you have certainly far surpassed any expectations already as to how high a level of energy you would be able to process in this timespan. So let us just return to the topic we started on, namely the near future and what it might hold in store for you all. As we have said, the veils are indeed thinning, and as they do, you will be able to reclaim your embedded memories from your old existence once again. You see, the time has come for you to straddle two worlds, in more ways than one. For just as you at the moment are straddling two timelines, or rather, have one foot in the old world and one in the new, so too will you be able to simultaneously occupy the realms of Planet Earth and the realms from where you harken. That is because you are all becoming sufficiently strong enough to rejoin your loved ones from back home while still residing in a human body, as you now will be able to do so without being tempted to let go of the anchor that holds your connection to earth. And with this reconnection to home, so much will follow, and instead of weakening your resolve to endure the rest of this arduous escalation process, it will in fact strenghten it, as you will once again reclaim all of your faculties. You know so well by now that you are something far more than a mere mortal human, and that you can claim powers that far surpasses anything you thought would be possible. Now the time has come to see just how powerful you all are, and this will show you in so many ways that you are more than able to fight this battle to the end. In other words, you are as the famous superheroes in your cartoons, able to literally carry the world on your shoulders. And you are carrying it up to it´s rightful place, far above that drab and dreary dark place it has been lingering in for far too long. We hope this message will make the load a bit lighter in the upcoming days, as they will be challenging in so many ways. We are aware that you are a bit tired of hearing the same news again and again, but remember this is a process that needs to be broken down into segments, as not even super humans such as you can bite off more than you can swallow at the same time. So just be aware that another portion is coming your way, so do not be afraid to take your fair share of it. It is served with the best of intentions, and it will do you all a lot of good, but just like many other medicines, the taste might not be agreeable at first. Just hang in there, and you will certainly feel the effects it will have on your body once you have ingested it, and just like the superheroes, you will feel how the strength will surge through your body and lift you all one step higher. Thank you for helping me feel small! This may seem to be a rather contradictory title, but it is in fact something that has been made very clear to me after I started to publish The manuscript of survival. As you may already know, it came as a surprise to me that I was supposed to channel this at all, and it was certainly unexpected to get a message that I was to start to publish it only a week after receiving the first installment. The impact the energies from these had on me was intense to say the least, so I had not given much thought to what the effects from publishing them would be. I certainly knew that they would be interesting to some and totally wrong for others, as this is the inherent nature of channelings, but I was not prepared for my own reaction after I realized that people actually read them and commented on them. Many of you also sent me personal messages telling me about how some of the words had spoken to you, and all of this has touched me deeply. I suddenly saw so clearly how connected we all are, and I felt a strong unity with people from all over the world. It was amazing to see that people from near and far – from Australia to Finland, India to Canada – had taken the time to share their thoughts on the channelings I had posted. A good friend recently said “I have never felt as small as I do now, but I have never felt as powerful either”. That is so true. This process is about letting go of the grasp your ego has on you, and when you do, that insistent little voice inside of you telling you to “be something big, be someone important” just fades away too. In it´s place comes the realization that you are only a tiny little part in this magnificent creation, like a little grain of sand on a beautiful beach. You are just like a cell in a living body, and you understand that you are indeed powerful beyond any limits, because you are linked together with everything that exists. So thank you to all of my beautiful brothers and sisters for reaching out to me! You have helped me to see that I am just a tiny speck of light, but together, we light up our whole world. Today we would like to take the opportunity to congratulate you all on the scope of your achievements so far. It is by no means any mean feat, as you have pulled yourselves away from the morass of sitting in a third dimensional world, pulled down by all of your low expectations as to what life has to offer. And now, you will start to see far beyond the horizon you previously deemed to be the real one, and you will find that not only is the horizon in fact limitless, it is also most welcoming. In other words, the only limitations you will have from now on, are the ones that you will impose on yourself, therefore we advice you not to put any out there, as they are certainly not called for. For ages, mankind has fought a loosing battle with himself and his ambitions, as the only ambitions that have been allowed, where those that encouraged only a fraction to lift themselves above the sea of humanity, and if they were to do so, they would be an easy target for those still insistent on holding the others down. Therefore, all through your history, those that showed any inherent traits of greatness were mostly shunned or hunted out of existence, as they were seen as a threat to society, and therefore needed to be removed at all cost. When we say greatness, we refer of course to those traits that are finally starting to seep out again from the most unexpected members of your society, namely those traits that signals a total shunning of any so-called social climbing. In other words, we do not talk about those eager and ready to rise in a man made hierarchy, we talk about those great ones with humble hearts. Living and breathing humans who realize that they carry the essence of god inside of them, and who therefore have no need to attach themselves to any of the so-called man made definitions of greatness. No, these are the ones like you sweet souls, who see that they are able to change their whole world, just by changing themselves into the essence of who they really are, not into something conform that fits into the narrow frame of your society. As we have said on so many occasions, it is you who are the bravest of the brave, the real heros in this saga. You are not here to amass great riches of the material kind, or to aquire fame and fortune given out by the fickle preferences of the masses. No, you are here to persevere through anything, so that the light you carry inside will finally pierce through the heart of darkness, and let it fall away once and for all. You may not realize that you have already more than fulfilled this part of your mission, for the heart of darkness has been well and truly ripped asunder by thousands upon thousands of arrows of light, arrows that have been shot out each time a human being finally finds his or her true soul, and your arrows, dear ones, never ever miss their mark. You will see the truth in this very soon, so do not let yourselves be lost in the illusion of darkness that stlll clings to your shores. They are but a remnant, a faint ghost imprint of what it once was, but for some time yet it will serve it purpose and darken the field of vision for so many out there who think they cannot live without this. You see, they have set their hearts on staying inside these limits imposed by the darkness, therefore they cannot survive without it. The combined energy in all of these fervent prayers for non-change is making these dark odors linger a bit yet, but never think that they will not dissipate. They will do so, and they will do so very soon, as now the storm of lighted arrows not only from your hearts, brave ones, but also from the very fabric of the cosmos, will effectively tear this flimsy fabric of unacceptance to shreds. Watch and wait sweet children, the show is coming to you and you will not want to miss it for anything – not in this world nor in any other you will care to experience. Because you are the ones that get to choose, and you have all chosen well, therefore the shores of tomorrow have already started to welcome you back to life. Rejoice, because you are the victorious ones! Never again will you feel the despair of being overlooked and not listened to, as the universe has heard your call for freedom, and it has given it´s reponse loud and clear. So too have you, when you have been asked to be a part of this great game, and therefore, you will all be richly rewarded and anointed as the true heirs of your own kingdoms. The sun has been very active this weekend. According to http://www.spaceweather.com/, a big sunspot erupted early this morning, following close on the heels of another CME that hit our atmosphere last night. In other words, if you have been spending most of these last two days unable to do much, and feeling achy all over, this could well be the reason. Today´s missive will be an interesting one, as it will thread the paths hitherto untrodden by many. The subject is indeed an important one, as it crosses the boundaries from your world to ours, but do not let that scare you off in any way. As we were saying, the continuation of this saga will entail going into unknown territory for so many, and on the surface, it will literallly be looking like going into the darkness. You all know that this is in fact quite the opposite of what you are all doing, but the appearance of being swallowed by the darkness is certainly a very apt one. It will be like being hurtled into deep space, and this is in fact just what is going on right now. The portals have been opened, and you are starting to feel the suction as the atmosphere on the outside and the inside strives to adjust themselves, much like when a giant door opens and the pressure difference needs to be leveled out. This suction feeling is not a pleasant one, and for many, it can be very scary indeed. You will feel like you are pulled headlong into something that has such a strong gravitational force, it is unescapable. But apart from the appearance, this is not a dark and empty void, this is a darkness suffused with so much light, you cannot even register it. We know we are speaking in parables here, but it impossible to give you a clear picture of this process, as it is much like being swallowed whole into one of your much talked about black holes in space, and in fact, this is just what you are about to encounter. But the difference between this process and the ones your scientists have so far described, is that this will not be a total annhiliation, far from it. It is in fact nothing but a total rebirthing process, and once you have entered this portal there is no going back. You cannot be ”unborn ” again, and remember that even if the proces itself feels more than you can bear, it is only a short transition from one stage into another, and you will emerge on the other side like a butterfly from the chrysalis. For the first time, you will be able to regain the strength you had before you came down to this third level planet, and you will literally spread your wings and take to the skies once again. The realms of the cosmos is something much feared by many humans, as it contains such a vast amount of information they unconsciously understand is beyond theer comprehension. Or, to put it in other words, they are aware of the fact that they have been separated from this information, but they have no way of knowing as to how and when they will be connected with it once again. Let us explain. The cosmos as you know it now its not made up of an ever-present emptiness, far from it. We are aware that this is not news to many of you, but to the populace at large, the cosmos is almost always referred to as an immense emptiness, something to be feared as it means the end of all life. Nothing could be further from the truth, as the cosmos itself is nothing but life. The problem is that for humans, it is a kind of lifeform they cannot feel at ease with, as it is certain proof that mankind is only a small player in this enormous construction that constitutes the grid of life. For centuries, mankind has held on to their belief that they are the pinnacle of creation, and that outside the limits of your atmosphere, there cannot be any viable life. What a shock it will be when it is made abundantly clear that you are only but a tiny drop in an ocean literally brimming with life. And intelligent life at that, we do not refer to life only in the form of some sort of primitive bacteria, able to subsist in extreme conditions in isolated pockets on so-called Earth-like planets like the ones your astronomers are starting to find in their search for otherworldly places that in some ways resembles yours. No, we are talking about whole collections of very advanced civilizations, far surpassing the rather primitive set-up you hold as the most advanced ever. It will come as a shock to all once that truth is made clear to all, and especially to your scientific community. They are even today upholding the belief that the laws of nature that you are ruled by, are the ones ruling the whole of creation. Therefore, there cannot be anything outside these narrow confines, ergo, life as you know it must be restricted to your planet. That is what we call hubris on a monumental scale, and they have something to learn as we pull aside the veils and expose their pititful limitations. Mind you, it is not limitations set up by themselves, but limitations put upon all of you by those whose interest lies in holding you confined within these narrow walls of imagination. Therefore we do not criticize them, we only want to open the eyes of those sufficiently awake to understand that these limits might be a tad bit narrower than the reality. Therefore, it is important to have some minds already opened on the day when the floodgates are opened to the max, and full realization sets in. Otherwise, there would not be any left capable of handling this kind of information, and you would be left with corps of scientists stunned into silence by what they see. That would do you no good, as you need the capacity of a fully operational human brain in order to help you as a species to evolve beyond the narrow scopes of your present level. In other words, you yourselves must take dedicated steps forwards, aided by us, but still walking forwards at your own volition. Do not expect to be lifted out of your misery without any effort on your side. This will not do, as it is indeed you yourselves who have to decide if you really want to advance, or if you prefer to stay trapped inside the old confines of mind and body. Find your voice – and use it. That phrase has been going round in my mind these last few days, and after I channeled the latest part of The manuscript of survival, I can hear it even more clearly. To me, it is obvious that we are here to do something special, and that each and every one of us have a defined “contract” to fulfill. I feel very strongly that this year is the year for opening up and starting to listen to that voice inside of you that is guiding you towards fulfilling your purpose here. The voices differ, and rightly so, as we are all part of a magnificent choir, and it is important that we understand that we must find our own voice, not just copy those around us. What is your true voice? For me, it was the realization that I was here in part to work as a channeler, and that it was my task to open up for these messages and making them public. It was not an easy choice, as it ran counter to so much I had done earlier in my life. But the moment I published the first installment of The manuscript of survival, I knew that everything else in my life needed to step aside as this was what I had to focus on. For my sister, it was resigning from her job as a copywriter in order to start studying to be a massage therapist and to delve deeper into her work as a yoga teacher. It is not always easy to follow that voice from deep inside of you, but when you do, you just know when you make the right choices. Then your hearts starts to sing, literally, and you feel swept along by a current towards something you just know will be everything you dream of. I know that so many out there surround themselves with all kinds of “noise” to drown out that insistent voice inside of them. They know all too well that they are trying to be someone they´re not, but the fear of change is so great that they prefer to live with the consequences of an unfulfilled life. That is easy to understand, and I do not blame them. Change can hurt, but now, I think that refusal to change will hurt even more. Especially for those who know deep down inside that they have a special gift they should share with the rest of us. It is not for nothing that The constant companions say that this journey is for the bravest of the brave. It is not easy to leave behind aspects of your old life, and for many, the changes can be drastic. I only know that once you take that leap of faith, you would never ever go back to your old way of living, no matter how hard the road ahead is. It is like you finally breathe fresh air after a long time under the water. I wish you all a safe journey towards finding and trusting your voice – I know you will sing beautifully! Today´s missive might be a bit hard to swallow for many, as we would like to delve further into the abyss of space. In other words, we would like to shed some light on some of the mysteries hidden from human eyes and minds there. For centuries, man has looked up to the sky, trying to find some kind of meaning in the seemingly endless profusion of stars that covers the night sky. For many, this source of mystery has been taking them on long journeys in their own minds, journeys that have sometimes taken them to the edge of their sanity. That is easy to understand, as this seemingly endless ocean of night can be too much to contemplate, and the thought of mayhaps being watched by countless unseen eyes from some of these pinpricks of light has had many sitting up in their beds at night unable to go back to sleep. The unseen is almost always scary, and the unseen cosmos is even more so, as it is on such a gigantic scale it is almost impossible to wrap your brains around it. Many have taken the easy way out so to speak, and chosen to believe that mankind is the only intelligent species inhabiting this vast cosmos, and therefore they can put aside any thought of actually being under scrutiny by others. Others amongst you have seen too many horror movies, and they are indeed just as firmly convinced that if there does exist any kind of intelligent life elsewhere, they are probably only waiting to pounce upon an unsuspecting Planet Earth, enslaving it´s inhabitants, and maybe even having them for dinner. And not as honored guests, rather as the main course. Forgive us our jests, but it is important to remember that although for some of you, the realization that you are by no means solitary inhabitants in this precious creation comes naturally, you are still in a minority on this planet, and for the rest, this simple fact would certainly make them fall even deeper into fear. Not only is their own world as they know it seemingly falling apart, you also seem have a lot of neighbours, and for them, that must be bad news. It is by no means bad news, but it will certainly take a lot to get used to the idea of this co-habitation, so it is indeed important that you start to ponder this fact more deeply. Remember, the time is not far off when we will all be visible to more than a few selected eyes, and when we do, it is imperative that the welcome we get is not lead by those certain of a swift annhiliation from the unwelcome guests. Remember, it is one thing to have this as an abstract idea to toy around with and to wish for, it is quite another the day you all realize that you have been sharing this planet and the cosmos with an almost immesurable number of other beings, most of them on a level of evolution that far surpasses yours. Not much of what you held for the truth can withstand this revelation, and therefore it takes a strong foundation to be able to stand on your feet when the ground is seemingly pulled from under your feet. Many will topple and fall, and they will be unable and unwilling to raise themselves up again, but for the rest, they will fall to their knees in awe and joy at the prospect of finally meeting the ones they have been longing to meet for such a long time. Again, many of you are of a very ”foreign” or rather extraterrestrial origin, and now this origin will make itself more and more heard above the din of confused human voices. You will be more than ready to regain your anscestry when that day finally arrives, but until then, it is important to start opening the doors to these innermost recesses of your heart and try to start up the conversation so to speak with those back home. This will help you in so many ways, and the answers you will start to hear in your mind will give you much needed confidence to approach the next level of awareness. The next level of awareness entails tackling so many and for you unknown talents, that is, talents that have atrophied as a result of stepping down your level of vibration in order for you to be able to inhabit a human body. Out in space, everything is possible, but down on Earth, you have so many limitations as to what you can do and what is deemed impossible by the so-called laws of nature. Remember, these laws are in many ways self-imposed, and as you raise your level of vibration, these laws become more and more null and void, and so you can start to access these other levels even more. The learning curve will be steep for many, and with good cause, as it is indeed imperative that you learn to master yet again those skills you had to leave at the doors once you entered the earthly domains. Remember, most of you are here with a specifc task or a defined objective, and in order for you to fulfill that, you need to be able to access this deep core that is the real you, not the outer layer of human entity that for so long has covered up your briliance. In other words, you will also be showing your true colours the day when the rest of us arrive on your shores, and then there will be no mistaking as to whom you really are. For those safely ensconced in the belief that humanity is the single species competent enough to evolve in any way, this revelation will be almost devastating. So too for those already frightened by the propaganda into thinking that anything non human is an enemy too be feared more than anything. So as you can see, this opening up of the layers that separate us will have a very, very strong impact on your society. Never forget that we have a whole arsenal at our disposal in order to make this transition as painless as possible, and when we say arsenal we do not refer to any kinds of weapons, far from it. Rather, it as a multitude of ways in which we can soothe the enraged and frightened minds so they will have an easier time to ingest and digest the fact that the world they know no longer will be the same. It is a peaceful way of ensuring minimum upheaval, but still there will be many who refuse to continue to live in a world they have to share with so many ”outsiders”. For them, there will be a swift and self-imposed exit from this life, and then they will have the choice of returning in a more ”advanced” and open incarnation, or they will be given the opportunity to start again in a similiar world to the one they left so abruptly. To many, this will sound callous, but again, it is important to remind yourselves just what is going on on your planet. You are on a journey from a third density planet towards one of a much higher vibration, and those refusing to raise their levels accordingly, cannot even continue to exist here. It will be like being transported to another planet where even the atmosphere is like posion to them. Their physical body is unable to withstand the onslaughts of these high levels of vibration, and it will break down in a very short time. So too their mind, as the effects of experiencing all of this hithero unknown activity carried out by souls clearly harking from a very foreign place will be too much for them to handle. As you can se, there are many challenges ahead when it comes to opening up to these heigthened levels of energy, awareness and co-operation. Therefore it is indeed very, very important that you start to prepare yourselves as we mentioned earlier in this script. You can do so in many ways, as you consciously go into meditation, during the dreamstate and also during your waking hours. Try to see out of the corner of your eye so to speak, and open up and allow the unseen to become visible bit by bit. This may sound difficult, but we assure you once you open your heart and mind to start these things to seep into your consciousness, they will make haste in doing so. It may come in many forms, and none of them probably quite as you expect, but allow yourselves to be surprised, and do not set any standards as to how you want this interaction to be. It will be like a small trickle at first, because you all need time to literally digest the fact that you are surrounded on all sides by so many unseen beings, all waiting to make contact with you. At times, it might feel a bit scary, but listen closely to your heart, and you will hear very clearly if there are any reasons to be on the alert. As always, there are those out there waiting for a chance to inveigle themselves on an unsuspecting human, because not everyone are of the light. We will not delve further into this subject at the moment, we will only repeat what we have said before. You know in your heart of hearts when someone is of the light and when someone is not, and this too will become very apparent in the upcoming days and weeks. Do not be afraid dear ones, as the beings of light outnumbers these remnants of darkness still lurking in the deepest corners at a million to one, but best be prepared as they like to come unannounced and try to sneak their way in the backdoor as it were. We foresee no problems in this, as those already in the light have nothing to fear, they will probably not even be approached by these little cretaures. But if they do, they are very easy to repel. Just stay clear in your heart and let your light shine, and you will be left alone by these parasites. So as you se, even if the cosmos is vast beyond comprehension, you have nothing to fear from the unending darkness making up your skies. It is made of light, and now that light has come to your little planet as well to stay for good. And with it comes a multitude of new friends, all eager and ready to make your acquaintance. We hope to see you soon! For many, the next few weeks will certainly go down in the books as amongst the most challenging weeks they will ever encounter. And this is not all. In addition to the personal level of discomfort, the whole planet will suffer from the onslaughts of some very, very intense outbursts of energy, not only from the sun, but also from places deeper into space. We are sorry to be the bearer of bad news, but as you have all gotten used to by now, when we talk about these intense periods of upgrading it is indeed unavoidable. They are also indispensable, as without these intense bursts of cascading energies being hurled into your planet from all around you, mankind would not be able to shake off the shackles of the old ways of living. You are by nature a complacent creature, best served by staying in the same rut, even if this rut eventually leeds you to a certain extinction. Let us explain what we mean by this, because it may sound very disrespectful on your behalf, when we in fact do not imply anything disrespectful by this at all. You see, mankind has been blinded in so many ways, and everything inside of you seeks to stay unchanged, both in the physical aspect, but also in the mental, and even if there are those around you actively seeking change, so many others prepare to stay silent and unmoving, even when they are crushed under the heavy burden of beeing a citizen of an unfree world, like you all are at the moment. There are exeptions of course, as some of you have already freed yourselves from this yoke and hitched your wagon to the new timeline. This is not the story about you, but about all of those still clinging to the old, so afraid of letting go, as they cannot see any salvation except by staying under the command of their old rulers. Remember, a human brain has a very hard time seeing a totally new way of doing things, as they have been well groomed to accept the solutions already put into place. These solutions have been well marketed as the only ones that can save humanity, and now that all of them are finally crumbling, panic will strike deep into the hearts of so many. This is not something new, but it is something that will magnify in this upcoming period, and rightly so, as now this falling down process will escalate in earnest. People will try to seek a solution to this, and the solutions many will seek, will entail giving away even more of their freedom into the hands of those who have placed themselves on top of the hierarchy, and they will certainly be blowing their horns about it! They will state ever more loudly that society is heading for certain destruction if not total power is given over to these ”well meaning” leaders, and they will try to convince all that they are the only ones capable of reining in this panicked horse and stopping it from running over the precipice. The medicine they will prescribe, will entail more control in every field. You can already see how elected politicians in some European countries are being overruled by technocrats residing in Brussels. In other words, people´s basic democratic rights have already been set aside in order to safeguard the investments the conglomerates of banks have made, and the ”safety measures” meeted out by these technocrats is not to save these same citizens from ruin. No, they have been put into place to uphold the rotten system that has enabled this financial burnout all by themselves. In addition, the freedom of speech is violated again and again, and the current legislation being discussed in the USA is a good example of this. From our perspective, it is very interesting to see how commercial interests are being held far above the right of human beings to communicate freely via their electronic media, and this is only a precursor of what is coming. Remember the truth is starting to seep out, mainly through these electronic channels, and under the guise of safeguarding the right of a few large conglomerates, the powers that be are trying to quell these words of freedom from contaminating even more than they already have. Again, you are the majority, but up until now, it is the minority who has been holding the reins. And they are not about to let go of them yet, rather they are more than ever insistent on tightening them further. For those of you already breathing the fresh air of freedom, it will be like watching a well known drama being played out, and it will be a fascinating affair. You will watch in awe as the old tries every trick they have in their book to hold back the inevitable tide, and you will watch in joy as they fail utterly to do so. Many will stay on their side, and in their fright try to shore up the walls of their master´s crumbling castle. But too many will eventually wake up from their slumber and join the groups already banging on the walls to make them fall ever quicker. It will be a sight to see dear ones, as a large proportion of mankind will be severed once and for all from these yokes of fear and oppression. In other words, the discomfort you all can bear witness to, and as we said be prepared for an escalation in the next few days and weeks, this will certainly be a small price to pay to ensure the liberation of so many of your fellow men. The constant companions warned me that “you will enter the new year with a bang, and maybe also with a whimper”, and I must say they have been right. These last few weeks have been so intense, and the physical body is certainly struggling hard to keep up the pace. My bones are literally aching, especially the head, jaws, lower back, hips and ankles. Every time I consciously connect with these new energies, I get a such a strong surge through my whole system it is at times difficult to breathe through it. It helps a lot to talk to my close friends and discover that they are struggling in the same way as me, so take this as a reminder to reach out to those around you whenever you are being hit hard by the downloads coming in. It will be interesting to see the effects these surges have on others, less “prepared” than us. I for one have already witnessed a few very unexpected and unprovoked outbursts of anger from strangers I have encountered, and I have a strong feeling that episodes like these will escalate. It is like some people are looking for an excuse to vent their pent-up anger and confusion in any way they can. As always, the best way to handle this is to try to stay from any emotional judgement and just take it for what it is, an outburst of frustration from someone who is pushed further and further out of their comfort zone by the increased levels of vibration. Or better yet, take a walk in Mother nature and avoid the urban stress altogether. In my part of the world, the days are slowly starting to grow longer. I live just outside Oslo, and if I take a 10 minute walk from my house, I can look down on the center of the city. 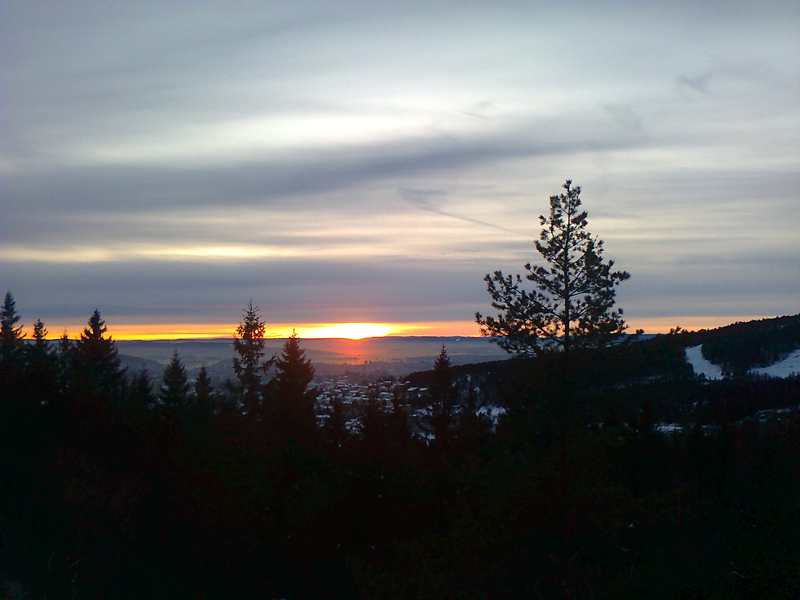 It´s nice to see the sunset over Oslo from the quiet of the woods!